Dr. Gloria Horsley interviewed Anne Baker at the 2015 Association for Death Education and Counseling conference. Baker experienced two significant losses in her life, but moved forward and became a hospice volunteer. 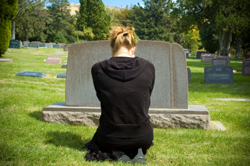 Now, she helps others on their death and grief journey. When she was seven, her mother died suddenly. Just three years later, her younger sister died. Baker recalls that at that time, there was no support for someone in her situation and she didn’t know how to look for or access resources. It was then, as a child, that she decided she wanted to dedicate her life to volunteering in hospices. Based in Maryland, Baker found a program as an adult and underwent three days of intensive training. “I was totally embraced by it,” she says. She worked as a caregiver for a while before taking on more responsibility. Now, she’s one of the directors of bereavement and “we offer all sorts of programs for adults and children,” she says. You don’t necessarily have to have a hospice-related loss in order to tap into the resources that Baker’s organization offers. “Anybody who is grieving, we offer services for,” she says. There are people who have decided they finally need to deal with their grief 20 years after it happened. Baker goes into schools, including elementary, offering a seven-week program for children who have experienced a loss. There are sessions on loss and grief in health classes throughout Montgomery County school districts. “We rely on our volunteers,” she says, currently managing up to 400 volunteers. They facilitate bereavement groups, and also make up an impressive community that is “Figuring out different ways to turn around their energy,” she says. There are hospices in most communities, many of which welcome volunteers.